Sheet Pan Cheesy Roasted Potatoes with “Chicken” and Vegetables are baked to perfection and coated with a creamy delicious cheesy sauce. 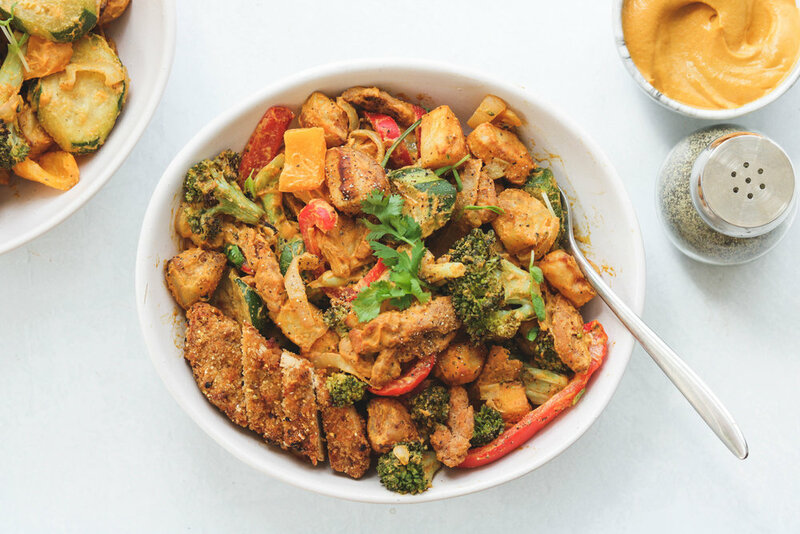 Use up left over veg and proteins and made this easy one-pan recipe that can also be meal prepped ahead of time! Gluten, dairy & oil free. If you know me, then you know how much I love potatoes, they’re my favourite carb source of all time. Versatile, cheap, easy to prepare and can take on the flavours of just about anything. My personal favourite is roasting them in the oven! Seriously, even when it’s not fry-day I crave them and literally wait for dinner time to roll around so I can make some dang delicious crispy potatoes. Lately, I’ve been into savoury breakfasts, so naturally, of course I turned to my beloved potatoes. This recipe is simple and easy to make which are two my requirements when it comes to cooking (especially in the morning) because I’m kept super busy on weekdays from school and work. The potatoes must be slightly cooked ahead of time before going in the oven or else the other vegetables and mock meats will burn while the potatoes remain undercooked. This can be done in the microwave by nuking it covered for 5 minutes or steaming for 8 minutes. Flip, mix and toss the potatoes, vegetables and chicken around the halfway mark so they roast evenly. Change up the vegetables by using whatever you have left in the fridge! Carrots, broccoli and cauliflower work perfectly in this roast as well. 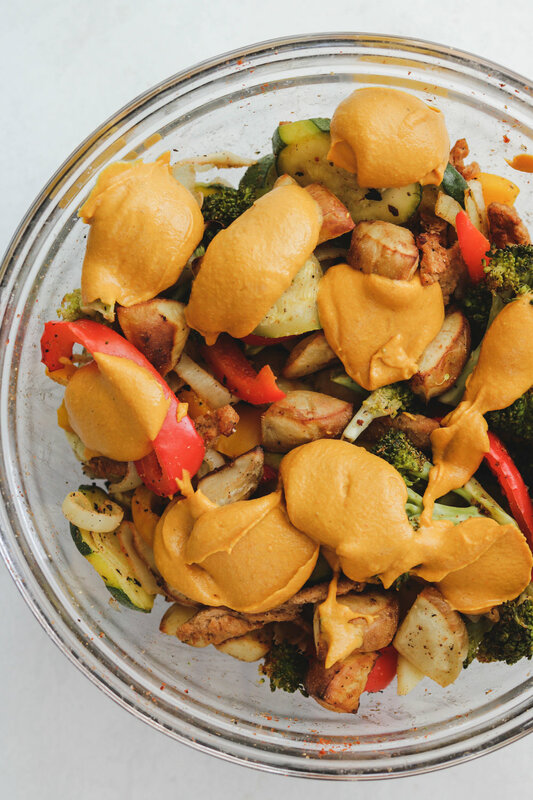 If meal prepping ahead of time, I recommending adding in the cheese sauce just before eating so the vegetables do not get soggy. If you want to save washing time and prevent washing bowls, here’s a trick I almost always do with potatoes. I chop them up and then place them onto the baking tray and pop those into the oven then preheat the oven. The potatoes tend to cook slightly as the oven is preheating. I do this all the time and it saves me so much time. 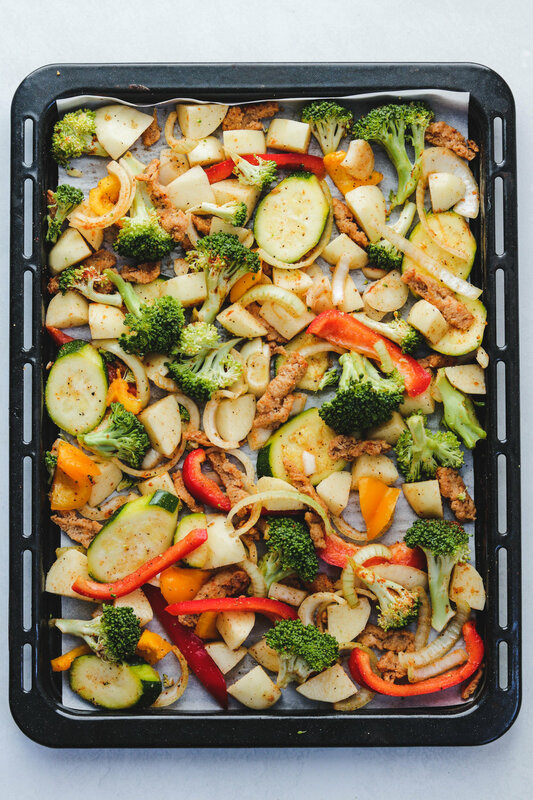 If you recreate this Sheet Pan Cheesy Roasted Potatoes with "Chicken" and Vegetables please share it and let me know what you think by tagging me on Instagram @lisakitahara, I love seeing all of your tasty recreations! Start by chopping up the potatoes and laying them on and nuking them into the microwave for 5 minutes. In the mean time, prep all your oter vegetables by cutting them all into approximately equal sizes. Once the potatoes are done, preheat your oven to 425 F.
Toss everything together into a large bowl along with the spices and bake for 20-25 minutes or until the potatoes and vegetables are golden brown. Remember to turn your tray and toss/flip the ingredients half way. Transfer back into a bowl (or do it on your sheet pan) and toss in cheese sauce! Adjust salt and pepper accordingly.